SLEEK, SIMPLE CHARGING STATION: This multi-device organizer with removable divider slots, houses up to five smartphones or tablets. Are digital gadgets and cables overtaking your life? The Prosumer's Choice 5-Device rack offers a sleek, elegant solution to organizing all your tablets and smart phones. 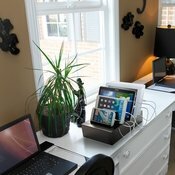 This beautiful, jet-black bamboo base docks up to five tablets and smartphones while hiding power strips and plugs inside the multi-tasking bamboo base that also includes slots for running and managing cables. 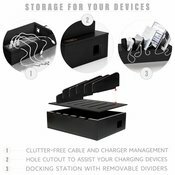 Reclaim your desk and counter space by using our bamboo charging station for multiple devices to hold and store tablets, smartphones, external harddrives and more. 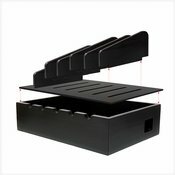 It’s not just a device rack – you can also use it to store your books, DVDs, discs, and other items. 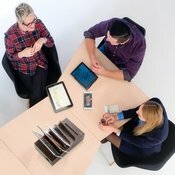 The dividers are modular and removeable, allowing you to store and charge up to five different devices such as smartphones, tablets and smaller netbooks. 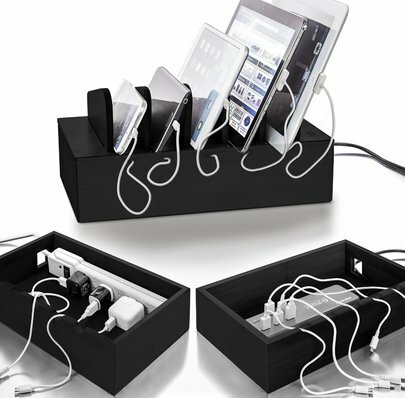 The charger case storage box located in the bottom can be used to hide power strips and cables, with slots built into the case for running and managing cords. 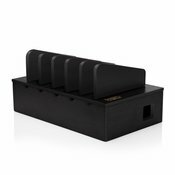 Our Bamboo charging station organizer is manufactured in a facility certified as socially responsible by the Business Social Compliance Initiative (BSCI). This convenient case and storage rack is crafted from beautiful, durable bamboo, harvested from forests certified by the Forest Stewardship Council (FSC) for maximum sustainability. Complemented by a classy black finish to blend with home or office’s decor, this versatile device stand for smartphones and tablets is designed for those seeking an earth-friendly, space-saving accessory for their office desks, kitchen counters and nightstands. 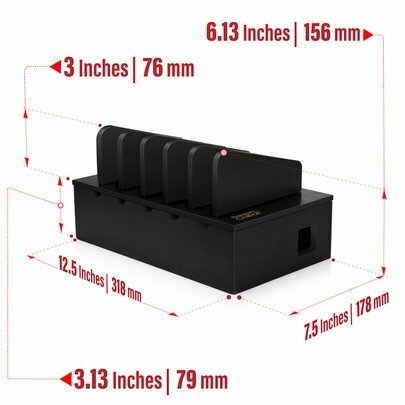 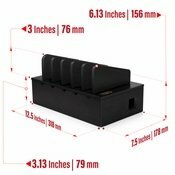 The anti-slip, high-friction rubber feet help to keep your newly organized charging station secure, along with five hook and loop straps and two adhesive strips to keep your wires, cords and charging units in one place. Say no to clutter - keep all your devices in one easy-to-manage place, charged and ready to go!